↑ Professor Arthur C. Gibson. 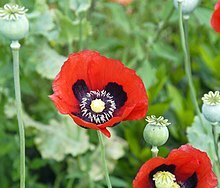 "The Pernicious Opium Poppy". University of California, Los Angeles. Retrieved February 22, 2014. ↑ "Define Opium at Dictionary.com"
↑ Opium : Dikotter, Frank, Lars Laamann and Zhou Xun. 2004. Narcotic Culture: A History of Drugs in China. Chicago: University of Chicago Press; Zheng Yangwen. 2005. The Social Life of Opium in China. New York: Cambridge University Press. ↑ Paul Harris in Peshawar (November 25, 2001). "Victorious warlords set to open the opium floodgates". London: Observer.guardian.co.uk. ↑ Suzanne Carr (1995). "MS thesis". ↑ PBS Frontline (1997). "The Opium Kings". ↑ 19,0 19,1 19,2 Paul L. Schiff, Jr. (2002). 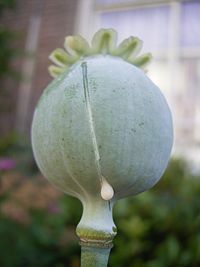 "Opium and its alkaloids". American Journal of Pharmaceutical Education. ↑ P. G. Kritikos and S. P. Papadaki (January 1, 1967). [www.opiumpoppies.org/2001/07/13/the-early-history-of-the-poppy-and-opium/ "The early history of the poppy and opium"]. Journal of the Archaeological Society of Athens. ↑ E. Guerra Doce (January 1, 2006). "Evidencias del consumo de drogas en Europa durante la Prehistoria". Trastornos Adictivos (in Spanish) 8 (1): 53–61. doi:10.1016/S1575-0973(06)75106-6.